Ethel C. Marden [left] and Robert D. Elbourn [right] operating SEAC. Over the course of its 100-plus year history, NIST has had some colorful characters who were also pioneers in their fields. For computer scientist Karen Olsen, one who stands out was Ethel Marden. In the 1950s, Marden wrote programs for the nation’s first internally programmed digital computer: the Standards Eastern Automatic Computer (SEAC). For 13 years, SEAC was a valuable tool used by various government agencies to do everything from accounting to checking calculations for the hydrogen bomb. It led to several innovations, including electric typewriters and the digital scanner, which was used to create the first digital image. 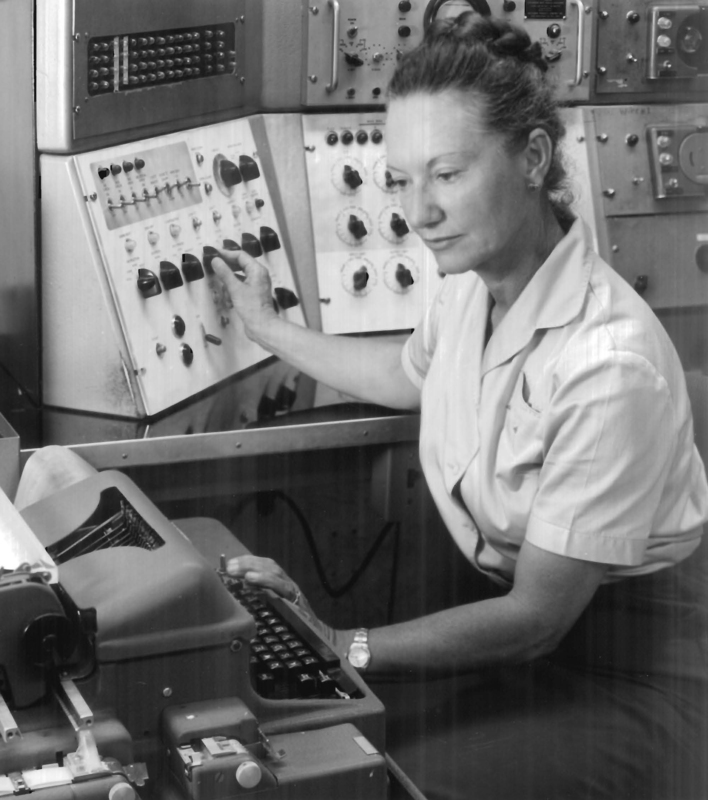 Ethel Marden, National Bureau of Standards (now the National Institute of Standards and Technology) computer programmer, operates the Standards Electronic Automatic Computer (SEAC) during the 1950s. Marden is also credited with being the one who successfully lobbied NIST to allow family-friendly part-time and flex-time work schedules. Marden, who worked at NIST from 1948 to 1971 and passed away in 2012, was a vibrant character, as was her husband, Luis, a globe-trotting National Geographic photographer/writer. He pioneered underwater color photography in collaboration with oceanographer Jacques Cousteau and discovered the sunken wreck of the H.M.S. Bounty (the 18th-century British ship portrayed in the movie “Mutiny on the Bounty”). Ethel Marden was a NIST mathematician who worked with SEAC, the nation's first computer with a memory, and lived a life that many would envy. Learn more about Ethel's work and life.